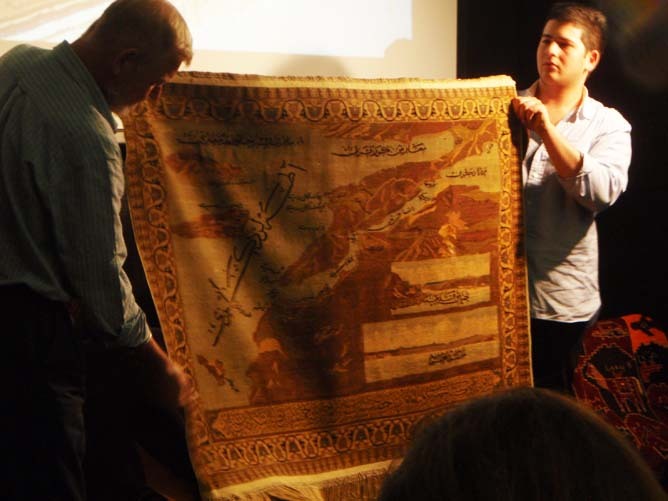 On Wednesday 13th April the Oriental Rug Society of NSW and the Asian Arts Society of Australia invited Nigel Lendon to present a lecture entitled What? Who? for Whom? and Why? The War Rugs of Afghanistan at the Powerhouse Museum in Sydney. Here Nigel is shown speaking about one of his favourite examples – which demonstrates the diversity of artefacts which can be included in the genre. 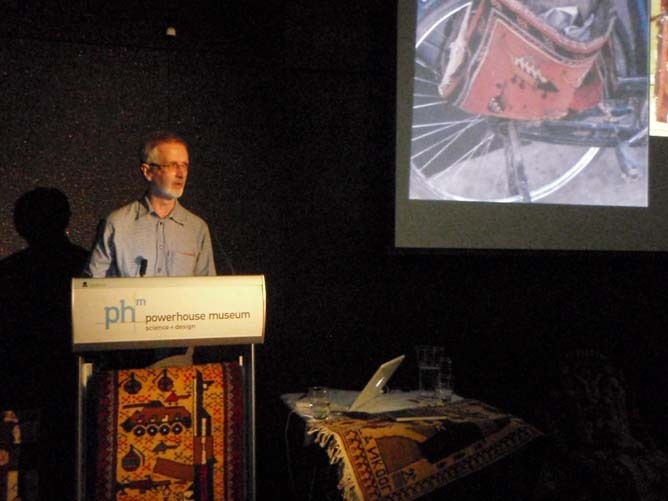 On screen is a saddle bag collected in Kunduz by the pioneering German collector Hans Werner Mohm. After the lecture several members of the Society brought along examples of different kinds of war rugs, which led to a lively discussion of form and content. Most remarkable were the two precursor rugs owned by the Cadry Family, which celebrate the Turkish defeat of the ANZAC forces at Gallipoli. Here is the extremely fine silk rug which depicts the Straits of the Dardanelles and the Cannakkale (Gallipoli) Peninsula from (then) an impossible aerial perspective. This example is one of two known to exist, the other being one of the treasures of the national collection in Istanbul. As well as this modernist aerial viewpoint, there are two almost-photographic cartouches which are montaged into the scene, which depict the landscapes of the battlefield. The elaborate calligraphy reveals that this rug was made for presentation to Enver Pasha. Reproductions of both these carpets are to be found in the catalogue of the exhibition mounted by the late Jaques Cadry Woven History: Stories in Carpets which was held at the State Library of New South Wales (1990). This catalogue is also one of the first such publications to include illustrations of war rugs. This entry was posted on April 15, 2011 at 2:42 am and is filed under Dealers in war rugs, Literature & Catalogues, Maps in War Rugs, Motifs in War Rugs, Nigel Lendon, Precursors to War Rugs. You can follow any responses to this entry through the RSS 2.0 feed. You can leave a response, or trackback from your own site. Thanks for sharing this with us. The silk rug here is just amazing and the designs just speak a lot about our history.